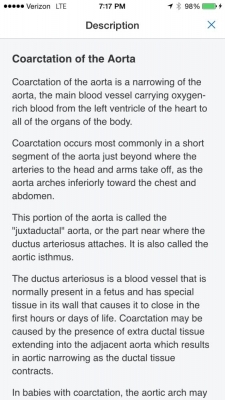 Congenital heart defects are the most common congenital anomaly in the US, affecting nearly 1% of all babies born in the US. 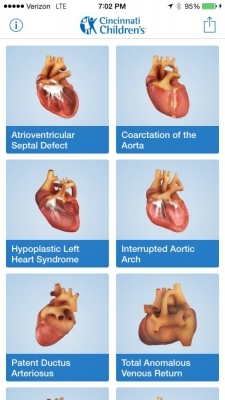 About a quarter of these defects are referred to as “critical congenital heart defects,” almost all of which are fatal if not surgically corrected. 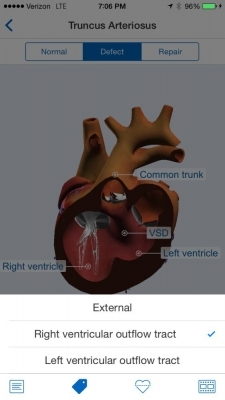 These defects, such as D-transposition of the great arteries or hypoplastic left heart syndrome, often require multiple-staged surgical corrections within the first year of life. These surgeries are quite complex, often stumping third-year medical students on their pediatric rotations. And that’s to say nothing of sleep-deprived and anxious parents. 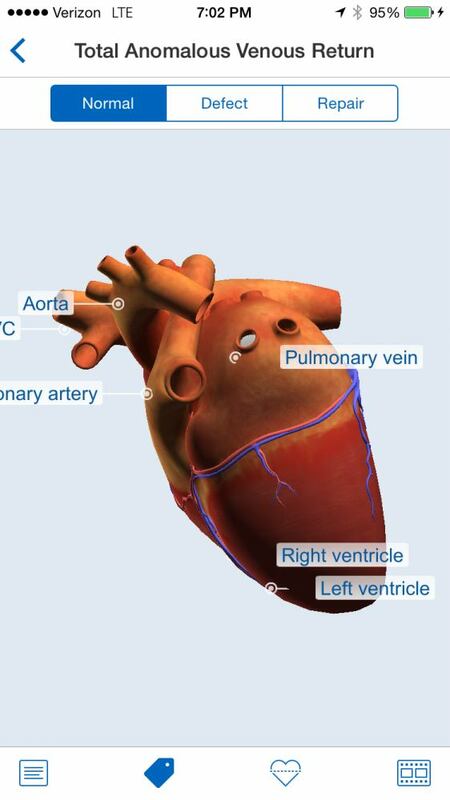 To help fill that gap is Cincinnati Children’s Medical Center’s excellent Heartpedia app, with interactive 3D models of congenital heart defects and surgeries to correct them. 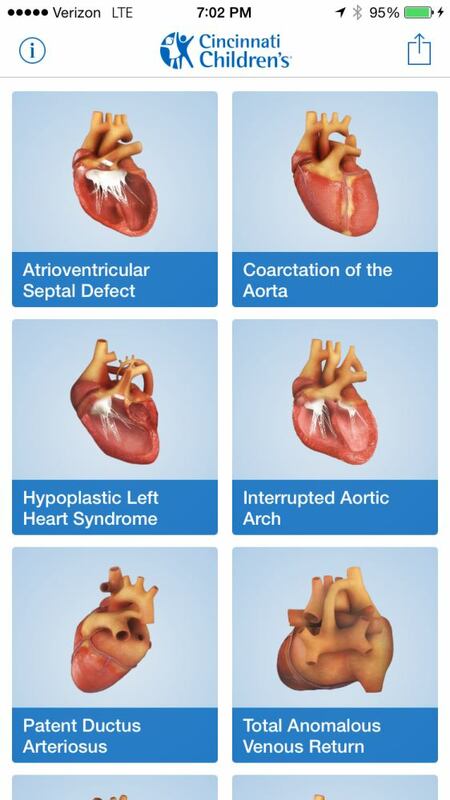 The easy-to-use app opens to a pictorial list of 10 included congenital heart conditions. Clicking on the defect brings you to a 3D model of the defect with heart chambers and great vessels labelled (labeling can be turned on and off). 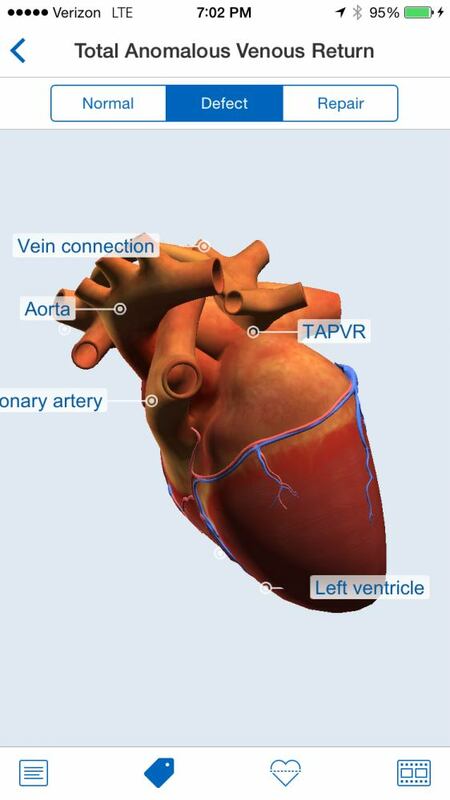 Users can switch back and forth between that view, a “normal” view of a normal heart, and a post-repair view with the cardiac orientation maintained. 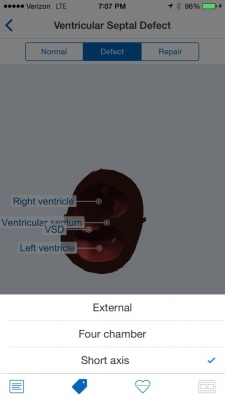 This user interface makes it particularly simple to observe how the defect differs from the anatomically normal heart. Each heart defect includes a detailed description that can be called up explaining the defect, associated problems, symptoms, diagnosis, repair and outcomes. Each defect also has multiple views — for example, views showing the right and left ventricular outflow tracts in truncus arteriosus to a short-axis or four chamber view in a ventricular septal defect. Most of the defects also have associated YouTube videos from Cincinnati Children’s which open within the app and go into detail about the defects, how they are repaired with similar (but more dynamic) 3D models. There are a few minor annoyances with the app, though they do not detract from its overall excellence. 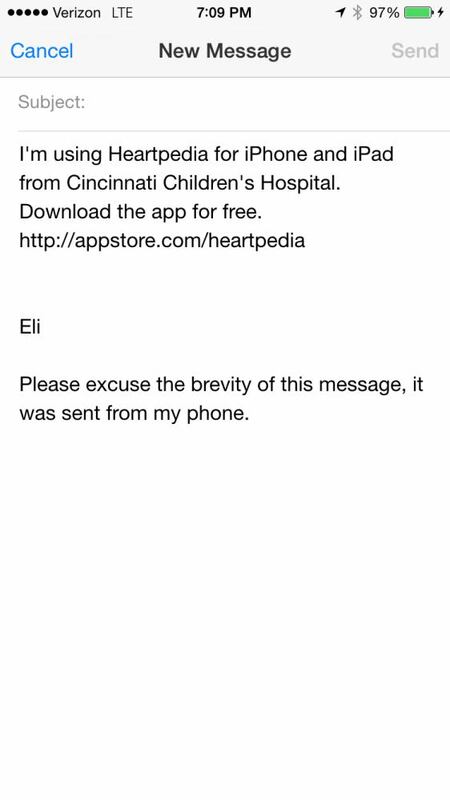 There is no ability to share pictures or videos — you can email or message from the app that you are using Heartpedia along with a link to the app but there’s no ability to share specific images without taking a screenshot. As a teaching tool for medical students, it would be nice if the app had dynamic blood flow to illustrate how oxygenated and deoxygenated blood flow with these lesions, for example to differentiate between cyanotic and acyanotic lesions. And for multiple-staged procedures, such as for repairing a hypoplastic left heart, the “repair” view only has the completely repaired heart, instead of showing the different stages of the repair. 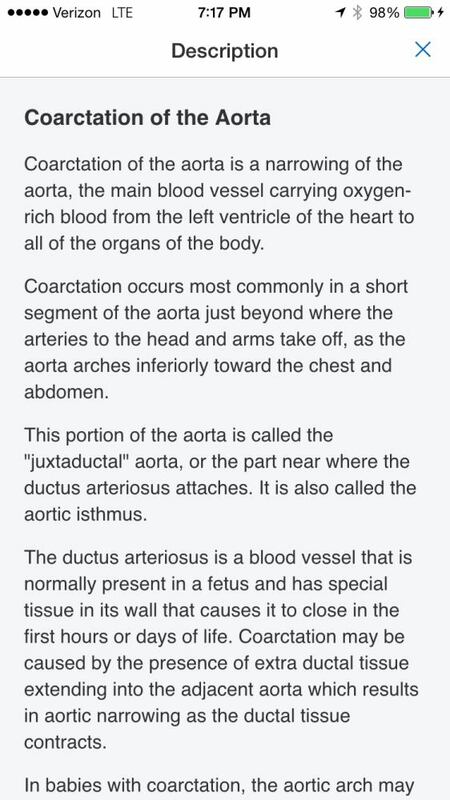 The Heartpedia app is a terrific use of mobile as a tool for teaching — both for parents and for medical providers. Behind a simple user interface it packs a great deal of information and is a must-have for pediatric cardiologists and cardiac surgeons, medical students and residents rotating through cardiology, and anyone interested in better understanding congenital heart defects. Intuitive, very easy to use. The app makes excellent use of touch-screen mobile interface, both with the 3D models and with integrated video. Lot of functionality for a free app. 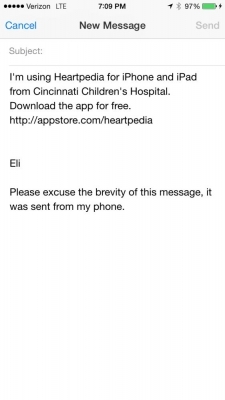 While it has 10 of the most common cardiac defects, hopefully future iterations will add more defects already included on Cincinnati Children’s Heart Institute Encyclopedia such as Ebstein’s anomaly and pulmonary valve stenosis. Eli Sprecher is a primary care pediatrician Boston Children’s Hospital, where he has worked leading clinical innovation initiatives as an active member of its primary care Clinical Redesign Committee and co-founder of his residency's Innovation Academy. He received his MD from Mount Sinai School of Medicine and MPP from the Harvard Kennedy School of Government.